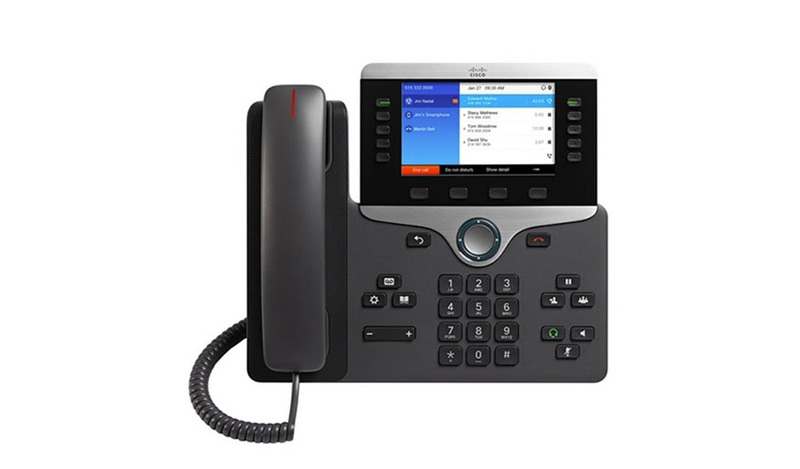 The Cisco® IP Phone 8851 combines high-fidelity, reliable, secure, and scalable voice over IP communications with Cisco Intelligent Proximity with seamless integration for personal mobile devices to support small to large enterprise businesses. Now you can increase personal productivity through an engaging user experience that is both powerful and easy-to-use. An internal 2-port Cisco Ethernet switch allows for a direct connection to a 10/100/1000BASE-T Ethernet network (IEEE 802.3i/802.3u/802.3ab) through a RJ-45 interf ace with single LAN connectivity for both the phone and a co-located PC. The system administrator can designate separate VLANs (IEEE 802.1Q) f or the PC and phone, providing improved security and reliability of voice and data traffic. The handset is hearing aid-compatible (HAC) and meets Federal Communications Commission (FCC) loudness requirements f or the Americans with Disabilities Act (ADA). You can achiev e Section 508 loudness requirements by using industry -standard inline handset amplifiers such as Walker Equipment W-10 or CE-100amplifiers. The dial pad is also ADA-compliant. 9.02 x 10.13 x 1.57 in.